I am a Fall Cleaner. When summer draws to an end I feel the need for that one last garage sale, purging the excess that accumulates and simplifying my homelife before school begins. My goal was to not buy anything new, but to reinvent, repurpose, and reuse. I have a lot of studio work with deadlines looming, so the first order of business was to clean out my studio, completely. Inspired by the latest issue of Where Women Create, I decided to move my packing supplies to the guest bedroom. 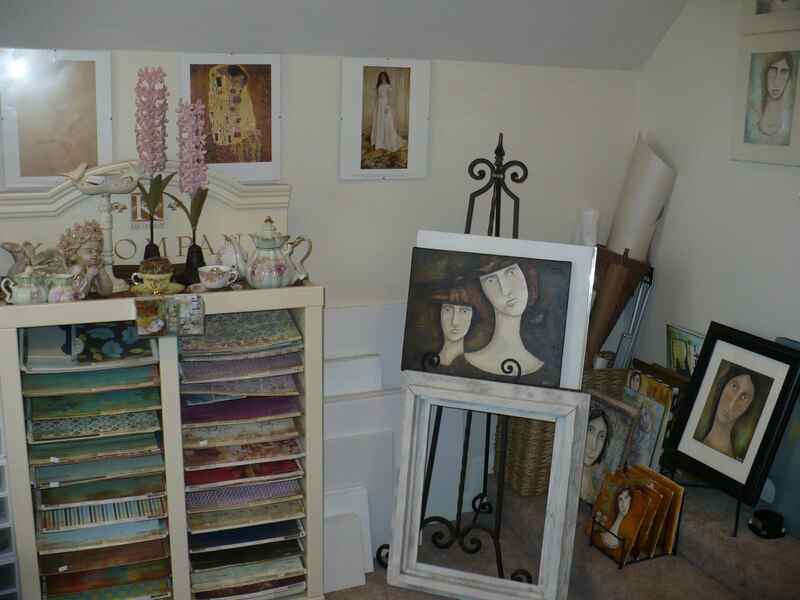 I don’t know why I always feel compelled to keep everything ‘art’ in my studio. I have an empty dresser in the guest bedroom, so all of the packing supplies are stored away, out of sight. 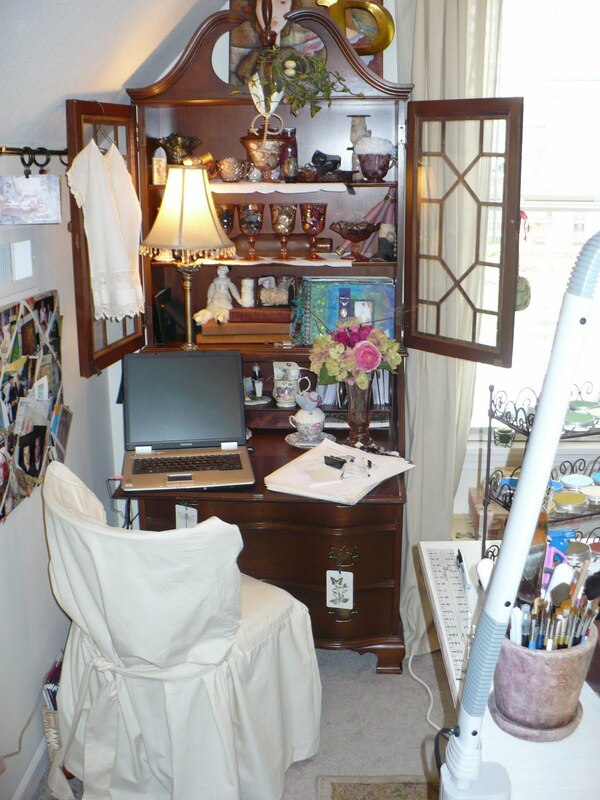 This left room for an office area in my studio which I desperately needed. 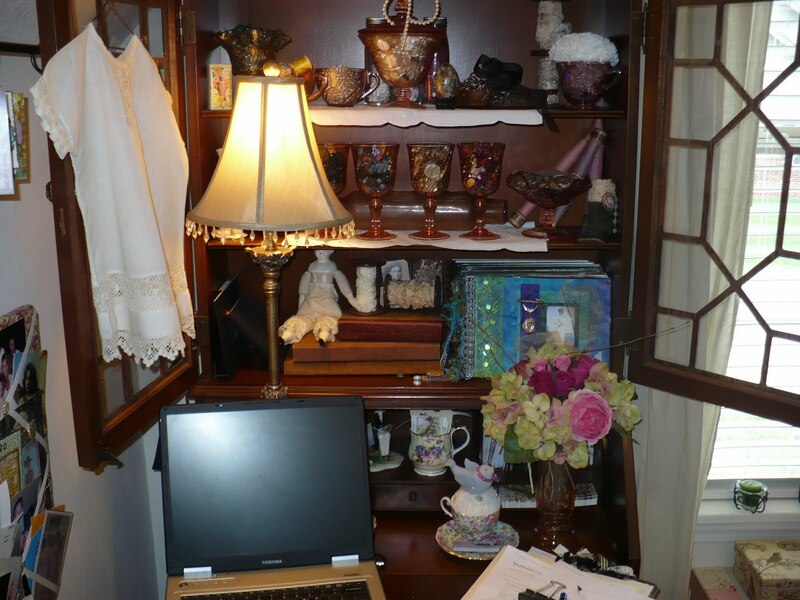 I moved my grandmother’s secretary desk up and completely love my cozy little writing station. 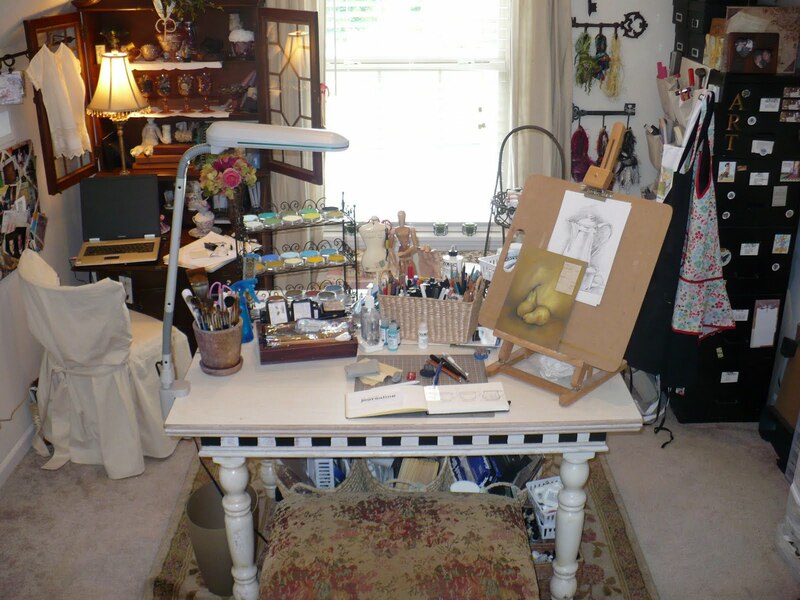 I repositioned my art table to the middle of the room. This opened up the flow and feel of the space. I also added the black checked border to the table, inspired by Teresa McFayden’s lovely workspace. 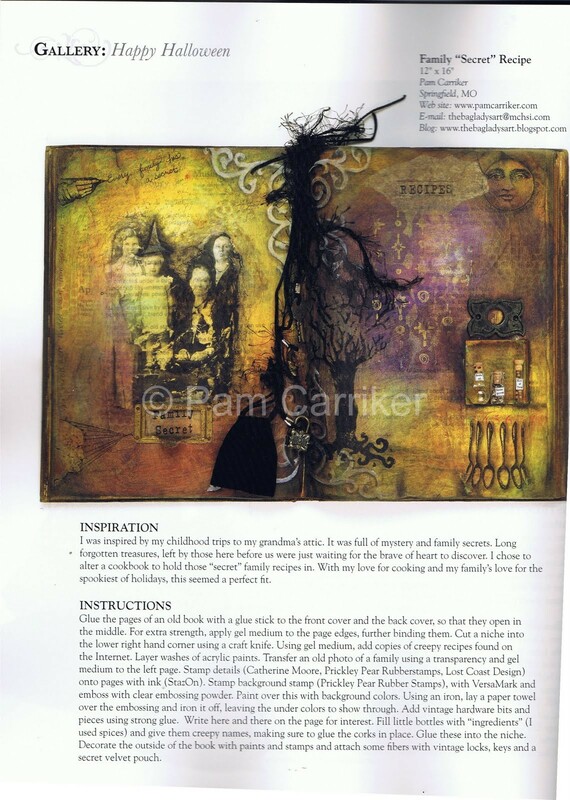 This added touch of black worked in the same way I use it on a journal page, tying together the hints of black around the room, giving it visual flow. I left my curtain rods up as I love to be able to hang up artwork on the little hooks, changing it out whenever I like. It is also another black element and the line draws the eye around the room. The simple cream walls, (the color is called Latte, how can you go wrong with that?) are warm and restful to the eye. The only thing I bought for the room was this little upholstered chair. 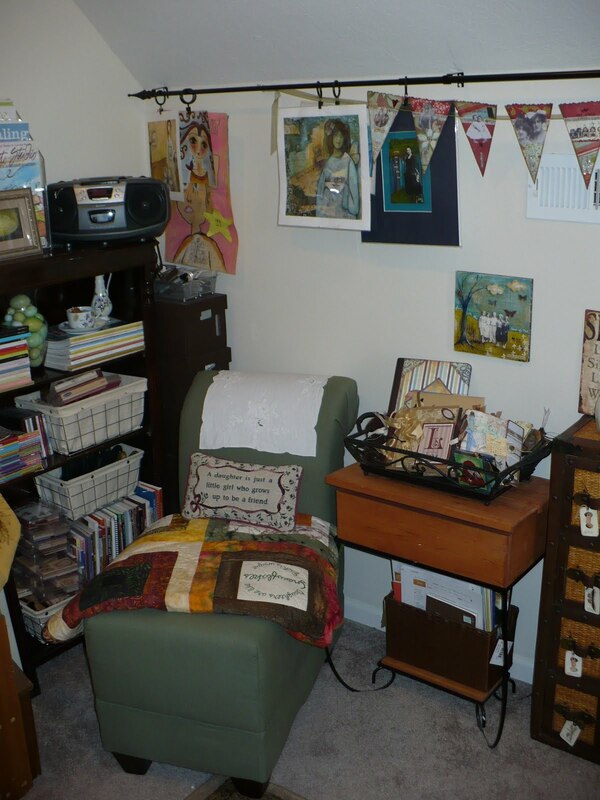 I wanted a little journaling nook, so I moved my bookshelf, added the chair, and filled the little end table with journaling supplies. On top is a tray filled with altered books I have made in the past. I so love this little display case for 12×12 papers that I snagged at a going out of business sale some time ago. The papers are too beautiful to hide away in a drawer. Along this wall I hung prints of artwork from the Masters that inspire me. On the stairs I keep rolls of watercolor paper handy as well as some of my finished work. The frame is one my dad made years ago from barn boards off the farm he lived on as a child. I have ideas for it later. Around the door I wrote the title from my first article. 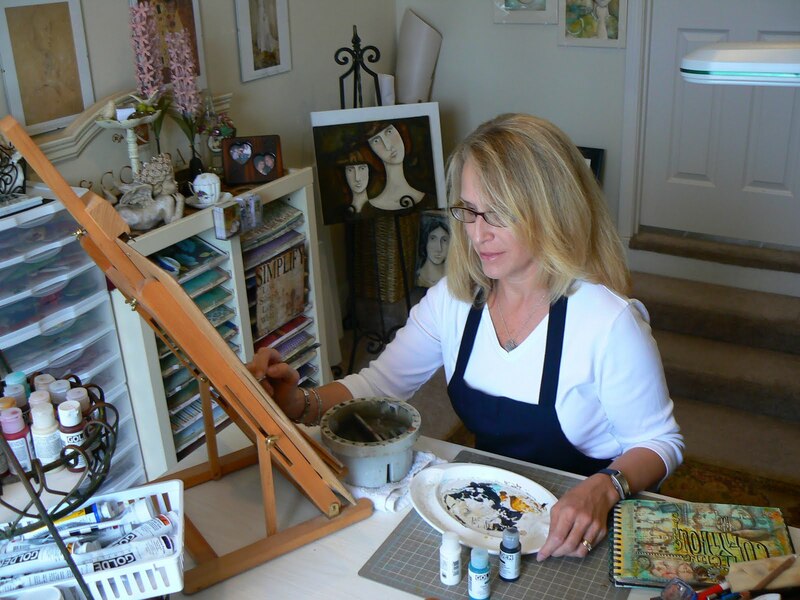 It was a defining moment in my art life and describes to a ‘T’ my creative state of being. It is how I live. I feel so much less cramped in my newly arranged space. The moment I step down those three steps, I feel the outside world slip away and I enter the creative place inside of me that I cannot deny. All of these pretty depression glass pieces have been hidden away in a cupboard. 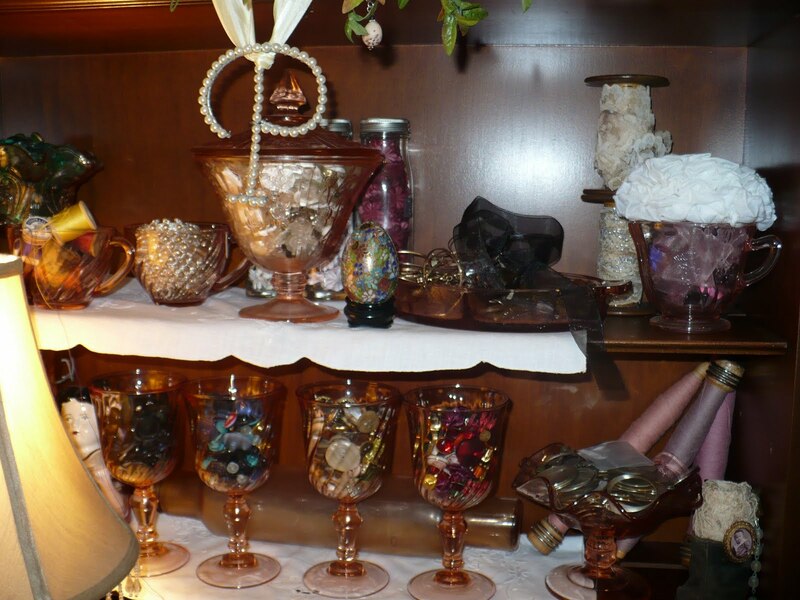 Now they are filled with beautiful trinkets that inspire me just by looking at them. I hope this inspires you to reinvent your space, fill it with things you love that you already have. 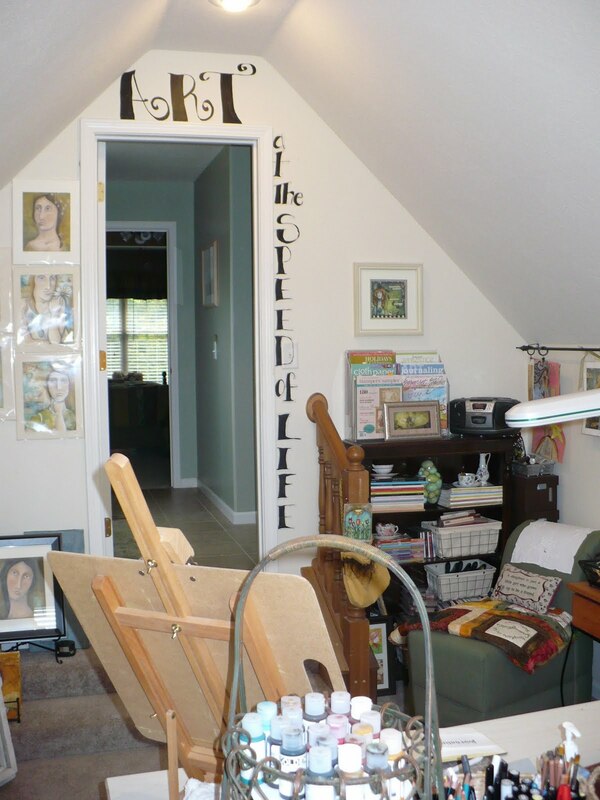 I was so encouraged to be able to makeover my space with one gallon of paint and my splurge of the little chair. On the horizon, Jenny Doh has asked me to do a ‘Workshop’ and ‘With One Palette’ features in a couple of upcoming Somerset Studio issues, so my muse is already working on ideas for those. While back to school and end of summer bring a tinge of sadness, it also brings free time that just can’t be found during those lovely sunny days. I have a full line up of projects to work on and I’m itching to start, but for this week, I want to squeeze out some more fun in the sun! I have so many things to share with you! 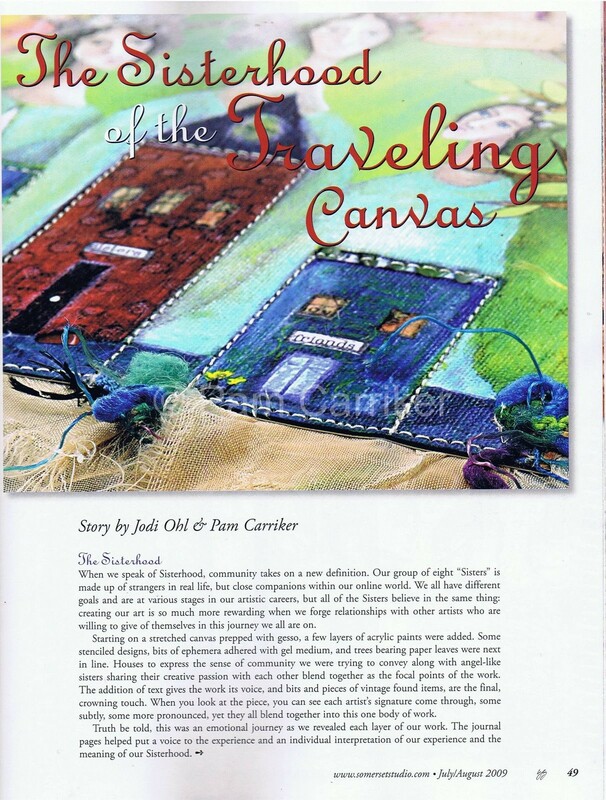 The Sisterhood of the Traveling Canvas has begun their own Blog!! 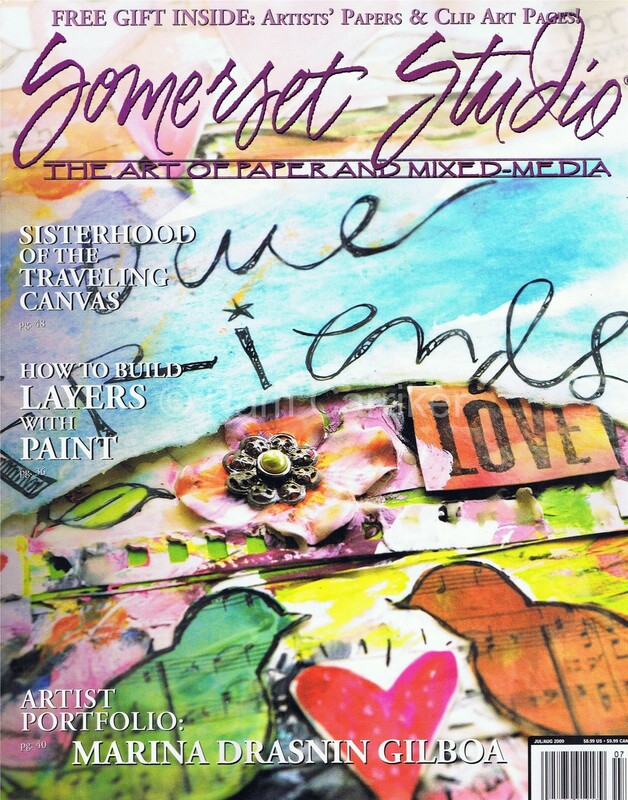 We will be sharing in a sisterly fashion, all about our art journeys and include information about where we are going, what we are doing, glimpses into our art and personal lives, and lots of artsy goodies along the way. This blog will be all about sharing our love of Art and each other. We hope our little community will inspire you to create your own little communities, to share in the joys and sorrows of an artistic life. The first order of business over there is to begin spreading the word about our contribution to aid the fight against Breast Cancer. 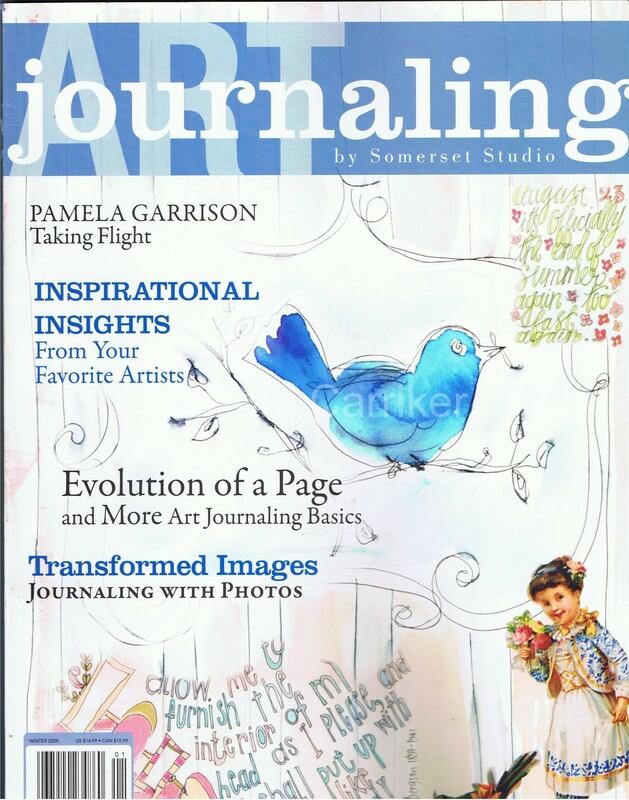 We have joined The Pink Team and offered up the lovely canvas AND the journal that are featured in the current Somerset Studio! They will be raffled off in a very cool way. This cause has become near and dear to my heart as my step mom was diagnosed right at printing time of our article. It was our intent to auction the work and journal off for a charity right from the start, but when I shared with my sisters of my step mom’s diagnosis, they stepped right up to the plate and agreed to donate our proceeds to this worthy cause. We would so love to have you stop by our fledgling blog and follow our journey right from the start. We will be including a post showing the never before seen pictures of the canvas in progress with some thoughts from the participants. 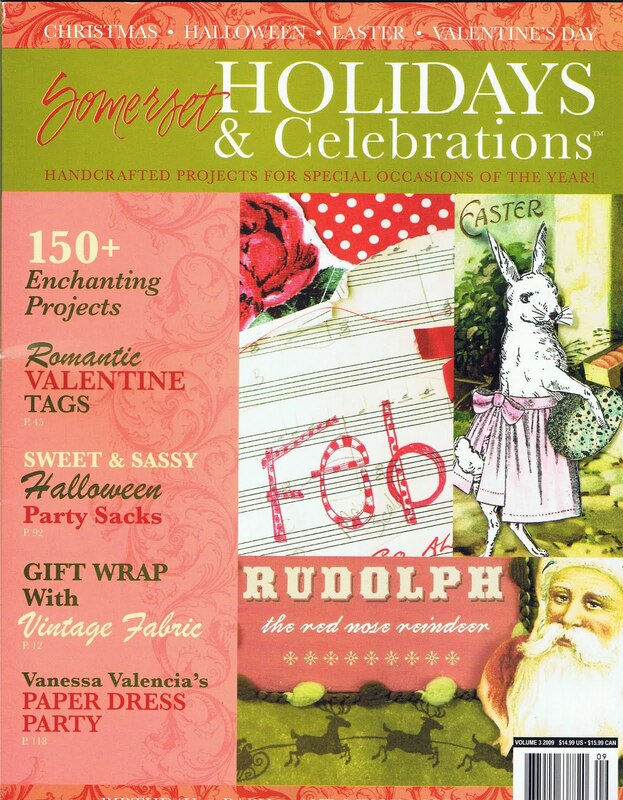 Well I mugged the mail lady today and finally got my copy of the latest Somerset Studio. She asked how I knew the magazine was coming so I showed her the article and she ended up staying to chat for several minutes:-) It is good to be friends with the mail lady! I am saving this to read on a plane tomorrow (if all goes well) but on my first run through I was excited to see several friends in addition to the sisters of the traveling canvas. 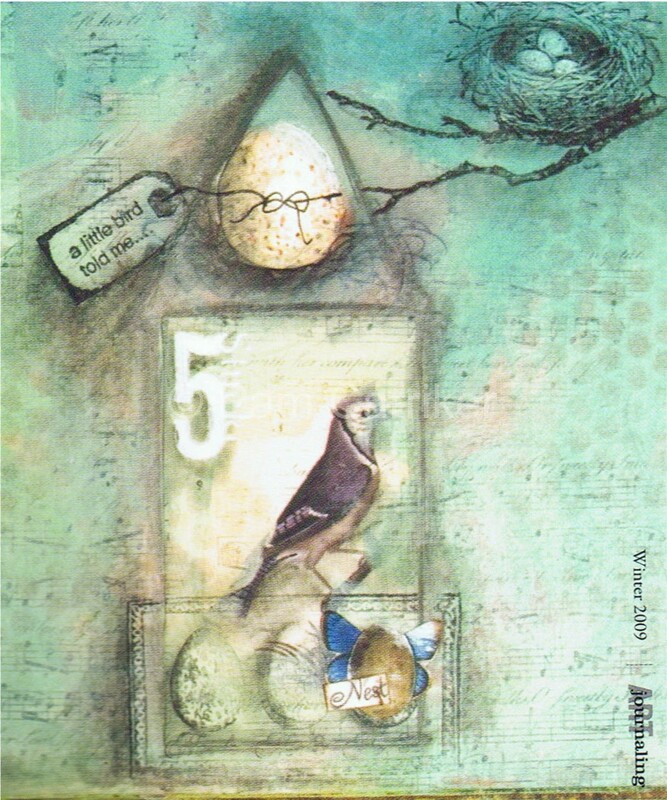 Chrysti Hydeck has the most wonderful artist papers as the free gift inside, gorgeous as well as sharing her technique for making them! Lorraine Reynolds has two amazing assemblages that jumped right out at me. And then there’s the ‘Sisterhood’. 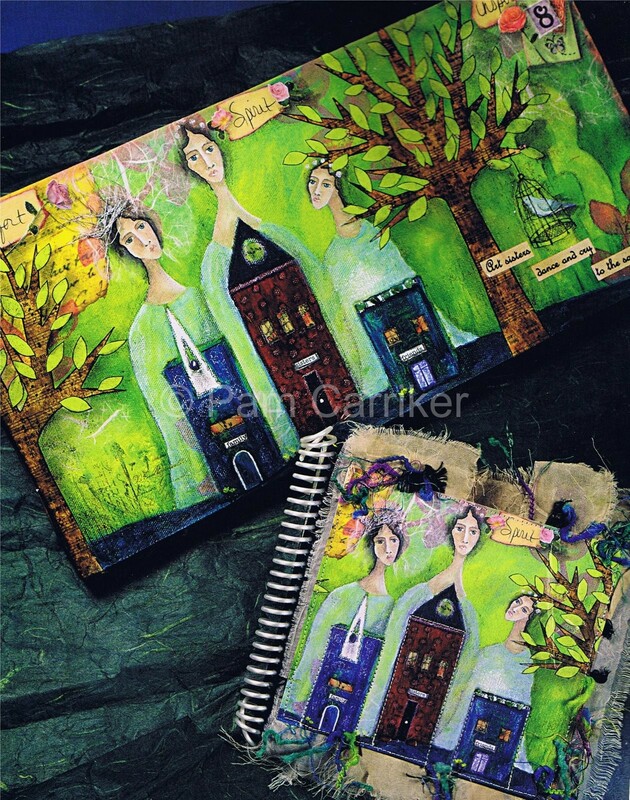 Eight women who came together on the Etsy forums to form the bonds of friends and sisters. Sharing techniques, giving advice, sharing the joys and sorrows of everyday life. Our own little community supporting each other in the way that only another artist can. 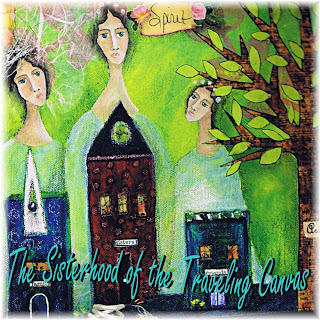 When I first had the idea of doing the Sisterhood of the Traveling Canvas, I had a much different vision of what it would be. I realize now that it is what it was meant to be all along. It was the best experience, creating and letting go and watching it develop into it’s final state. Thank you sisters for sharing this experience with me and for all of the other day to day sharing that takes place in our little world.